Children’s Aid Society provides professional child-focused therapeutic services to children in York, Adams, and Franklin Counties ages 3-17. Our clinical staff has a wide diversity of specialized training, including play and art therapy, to meet the needs of children and adolescents in a safe, supportive and confidential environment. Our clinicians are trained trauma therapists, with specialization in the Trauma Focused- Cognitive Behavioral Therapy (TF-CBT) evidenced based treatment modality. Children’s Aid Society currently accepts Access (Medical Assistance) at all our centers. We offer reasonable rates on a sliding scale for self-pay clients. other emergency situations which jeopardize the safety and well being of the child and necessitate temporary parent-child separation. The average stay for a child is three days. During his or her stay at the Crisis Nursery each child receives care by trained, loving staff and volunteers. These professionals provide individual attention to children who are coming from stressful environments. Parents are encouraged to visit with their children by phone or in person each day. Our Family Advocacy program is a comprehensive outreach program for parents whose crises cannot be resolved in the three days when their children are staying at the crisis nursery. For some families three days is not enough time to overcome the myriad of obstacles they face, tackle their many challenges and achieve their goals. Family advocacy is an intensive and comprehensive program for parents and guardians who use the nursery on a repeat basis. Our Family Advocate works with parents to help them find the resources they need to provide a supportive family environment for their children. 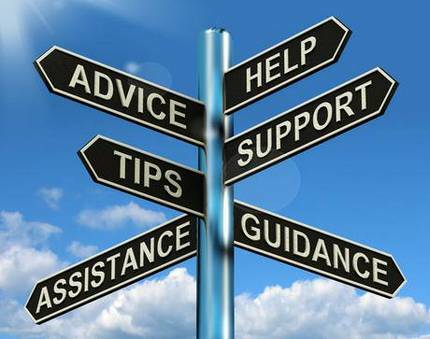 Parents are referred to our Family Advocate through the Crisis Nursery. For more information call 717-845-5771. Located at The Nicarry Center in New Oxford God’s Closet is a clothing room for children ages 12 and under. Low income families can come and “shop” for clothes, shoes, and coats for their children. If we have toys or diapers in stock they are welcome to those too. Anyone can refer a family to us for help. God’s Closet helps families offset the cost of keeping a rapidly growing child in clothes. God’s Closet is open on Tuesdays from 9 a.m. to noon, Thursdays from noon to 3 p.m. and by appointment. It is a partnership between Children’s Aid Society and the Adams County Foster Parents Association, we have the space for storing clothes and their members volunteer to staff God’s Closet. Volunteers do a great job of keeping the clothing bins organized and stocked. The Incredible Years Series (IYS) is a prevention and intervention program intended to enhance children’s social and emotional competencies, and ultimately reduce behavior problems. The Incredible Years Series has been found to decrease harsh discipline practices, improve pro-active parenting skills and the parent-child relationship, enhance children’s academic and social competence, and decrease aggression. The parenting program is recommended by the American Psychological Association Task Force as meeting the stringent criteria for empirically supported mental health interventions for children with conduct problems. The Incredible Years series is an evidence-based intervention recognized through the Blueprints for Violence Prevention and SAMHSA model programs. At Parent Support Groups, parents can expect to share with others who are going through some of the same experiences, learn from one another, including experienced parents and trained volunteers, receive information on available community resources and topics related to parenting. and improve parenting skills and relationships with children and families. 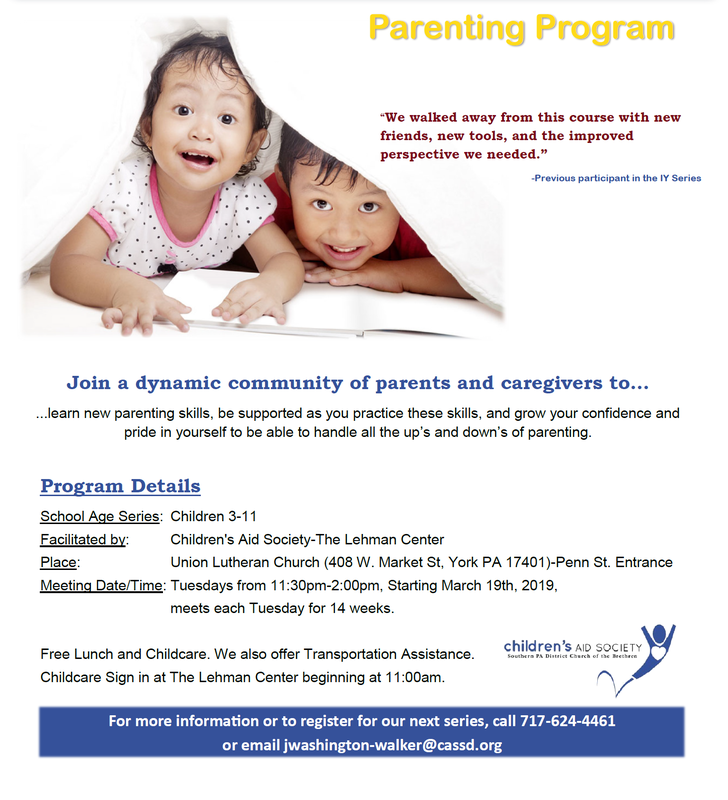 Support Groups are free of charge and welcome parents and legal guardians to attend! Thursdays at "The Lehman Center"
Signups are not required to attend, however if you are attending for the first time and bringing your child/children, please call prior so enough childcare is available. Our 24-Hour Hotline and Referral Service is available to parents and caregivers. Trained and caring staff listen, offer immediate support and help callers work through their crisis. Staff provide callers with referrals to other community resources that will help resolve issues and provide additional support. We are an outgrowth of One York: Government & faith-based community groups coming together to share resources & opportunities. We quickly realized that there is an immediate need for essential services to assist York’s homeless population and fill the gaps in services in the county. We were introduced and visited Carlisle C.A.R.E.S and New Hope ministries early on in our process and we adopted our name of York C.A.R.E.S. to associate with Carlisle and Gettysburg C.A.R.E.S. both well developed and recognized homeless outreach organizations. Homeless individuals are transient by nature and circumstances. 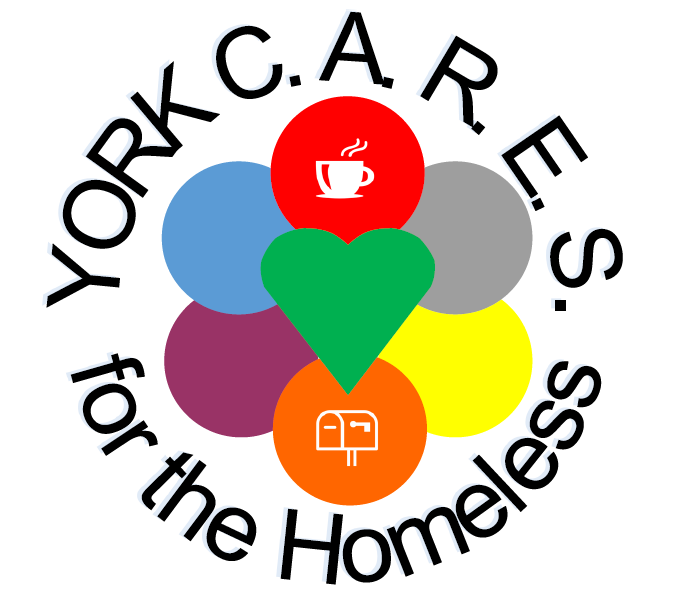 The name York C.A.R.E.S. identifies our work serving the needs of the homeless and welcomes them with familiarity. We concentrate on the needs of homeless men, women and children and we seek to fill gaps not presently met by other groups in York county. We are currently operating a Coffee Spot and Mail Spot through the Salvation Army, South Duke Street, York PA – Monday –Friday 1-2:30 pm which provides a place for coffee, conversation and community out of the heat in Summer and out of the cold of Winter. We provide information on essential services in the community for food, clothing, shelter, housing, transportation, counseling, and employment and develop a full service day resource center for the homeless, similar to Carlisle C.A.R.E.S. To Continue to collaborate with others who have complimentary services to fill the gaps in the community. Our final logo has all the essential services identified and we plan to provide at the day resource center. Praying daily for our work and outreach to the most vulnerable in our community. Volunteer to help at or host one of our Spots. Hold a drive to collect in-kind supplies for the Spots. Hold a special monetary collection or place us in your funding budget. Invite us to come an share our vision for the future with your group. Distribute our Spot cards and flyers to those you know and serve.